"Professional attitude and attention to detail"
"As a nervous patient I am made to feel at ease by the team's friendly attitude"
"Very caring and all members of staff make you feel comfortable"
Welcome to A&A Dental Clinic, Vancouver best dentist, where Dr. SAVITA DHINGRA, DDS, provides cosmetic, neuromuscular, sedation dentistry, and general dental care to patients. We believe patient education is a crucial part of dental medicine, so we’ve packed our website with all the information you need to make an informed decision about your dental care. Or, if you’d prefer, we also offer a free Consultation where you can tell Dr. Savita your problem, and she can offer recommendations for how to precisely determine the best treatment for you. 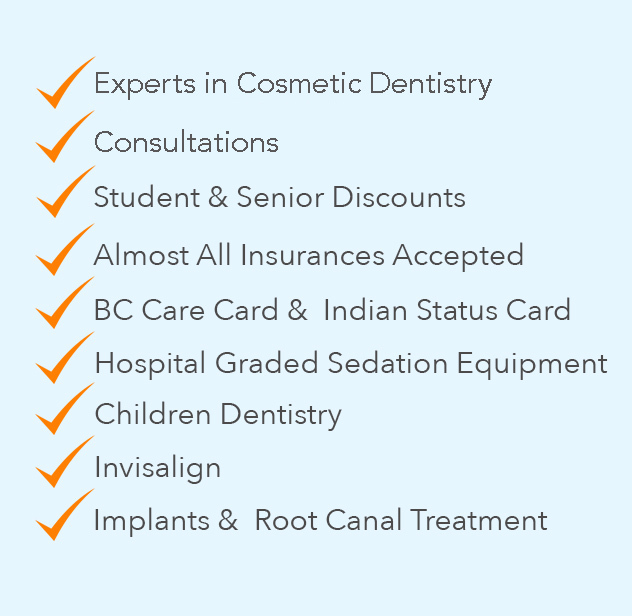 Provide you with excellent dental care. Offer you all the treatment options available, allowing you to make the choice that suits you best. Take the time to answer all your questions and explain your treatment. Accommodate your busy schedule with early morning and late evening appointments.